Indonesia has many beautiful locales and Bali is the most popular of them. Created by the hands of Gods, the beautiful island is one of the blessed vacation spots in the world. Sun-kissed shores, crystal-clear water, host of adventures, authentic Balinese massages, delectable treats and more welcomes visitors to the island. With Another Side of Indonesia Itinerary get ready for an incredible experience. Indian Holiday offers an amazing 6-Day tour where you can explore the beautiful sights, enjoy adventures and collect experiences of a memorable vacation. Peruse the detailed itinerary for more information.Airfare charges. Arrive in Bali, known as a paradise on Earth. Meet our tour representative and be assisted with transfer to your hotel. Denpasar International Airport, Bali is a standing example of modernization and simplicity, a pleasant welcome to the heavenly island. At the very exit of the airport, you will find the magnificent statue of a battle scene between Gatotkacha and Karna. Apart from being a beautiful photo-taking sight, it is also believed to lend spiritual protection and safety for all incoming and outgoing flights. Check-in to your hotel for overnight stay. Start the day with appetizing breakfast. Later, proceed for a full day excursion to the Kintamani Volcano. Witness up close the essence of Bali. The first stop of the sightseeing tour is Batuan village famous for traditional batik and hand weavings. Next, pay a visit to Mas village which is famous for wood carvings. Last stop at the Celuk village which is popular for silver and gold works. 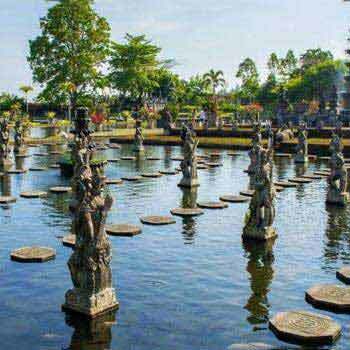 Thereafter, proceed to one of the most historical and ancient Hindu temples in Bali. Continue with your tour to the Mount Batur and Lake Batur in Kintamani village. Enjoy stunning views of the beautiful locales. The tour ends in the famous Ubud market. Have a look around, there are various shopping options perfect to collect souvenirs for your vacation. After a fun-filled day, return to your hotel for overnight stay. Start the day with an appetizing breakfast, after which proceed for Bali Safari and Marine Park. Both of these attractions are perfect for animal and nature lovers. Located in Gianyar, the sanctuary showcases many of Indonesia's forms of wildlife from both the land and the water. On your wildlife exploration get the chance to cuddle a baby orangutan, tiger, lion or leopard. Spot and get up close to over 60 different species on your safari. You can trek on foot or take a tram, straight through animal enclosures. 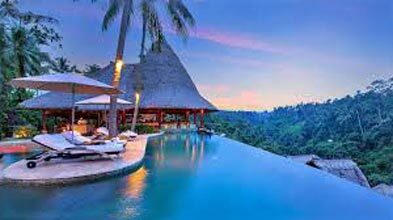 The sanctuary apart from being a habitat for wildlife features genuine Balinese culture with temples and traditional style huts and buildings. The tourist attraction is a well-balanced place portraying both traditional Balinese culture and thrill of adventure. After a well-spent day, return to your hotel for overnight stay. After a quick breakfast, leave for a spectacular experience. White water rafting on Ayung River is an experience which will one of your favorite memories of a Bali holiday. It is a great water adventure amid the beautiful landscapes. Whether you are 5 or 75, a sport enthusiast or a learner, white water rafting in Bali is safe, fun and a breathtaking experience. The fun-filled day is followed by a scrumptious local Indonesian buffet. Exerted from excitement, return to your hotel for overnight stay in Bali. Today morning, after you are done with breakfast, get ready to enjoy the beach side of Bali. A holiday in Bali is incomplete without watersports, so get to the famous Tanjung Benoa beach. The sun-kissed shores overlooking the azure waters are perfect for adventures. Try out sports like parasailing, banana boat ride and jet-ski. There are many other options to choose from. Many shacks and restaurants are lined up along the beach, where you grab these delicious treats after having fun with watersports. After a busy adventurous day, relax with authentic Balinese massage at the Bali Orchard Spa. Return to the hotel for overnight stay in Bali. Start the day with a hearty breakfast. Pack your bags and check out from the hotel. Get transfers for your onward flight. Return home with cherished memories of your holiday in Bali. Kintamani Volcano Tour & Ubud Village. Bali Safari & Marine Park (Jungle Hoper pass). White Water Rafting on SIC basis. Full Day Benoa Beach with Uluwatu temple Sunset Tour, Benoa Watersports Tour (Parasailing, Banana Boat Ride & Jet Skii included). 02 Hours of Authentic Balinese massage @ Bali Orchid Spa on SIC basis. Plenty of Watersports option to choose from. All sightseeing and airport transfers.